Notes: The topography of Venus has only been seen by radar. The best radar images of Venus are from the Soviet orbiters, Venera-15 and 16, and the American orbiter Magellan. NASA is collaborating with the European Space Agency (ESA) on this ESA-led mission to Ganymede and the Jupiter system. ESA plans to launch the mission in 2022 for arrival at Jupiter in 2030. It has a tentative model payload of 11 scientific instruments. The NASA contribution consists of three separate projects: one full instrument, Ultra Violet Spectrometer; two sensors for the Particle Environment Package suite of instruments; and the transmitter and receiver hardware for the Radar for Icy Moon Exploration instrument. This artist's rendering shows NASA's Europa mission spacecraft, which is being developed for a launch sometime in the 2020s. On Feb. 15, NASA's Europa multiple-flyby mission successfully completed its Key Decision Point-B review. This NASA decision permits the mission to move forward into its preliminary design phase, known as "Phase B," beginning on Feb. 27. A highlight of Phase A was the selection and accommodation of 10 instruments being developed to study the scientific mysteries of Europa. The new mission phase is planned to continue through September 2018, and will result in the completion of a preliminary design for the mission's systems and subsystems. Some testing of spacecraft components, including solar cells and science instrument detectors, has already been underway during Phase A, and this work is planned to continue into Phase B. In addition, during Phase B subsystem vendors will be selected, as well as prototype hardware elements for the science instruments. Spacecraft subassemblies will be built and tested as well. 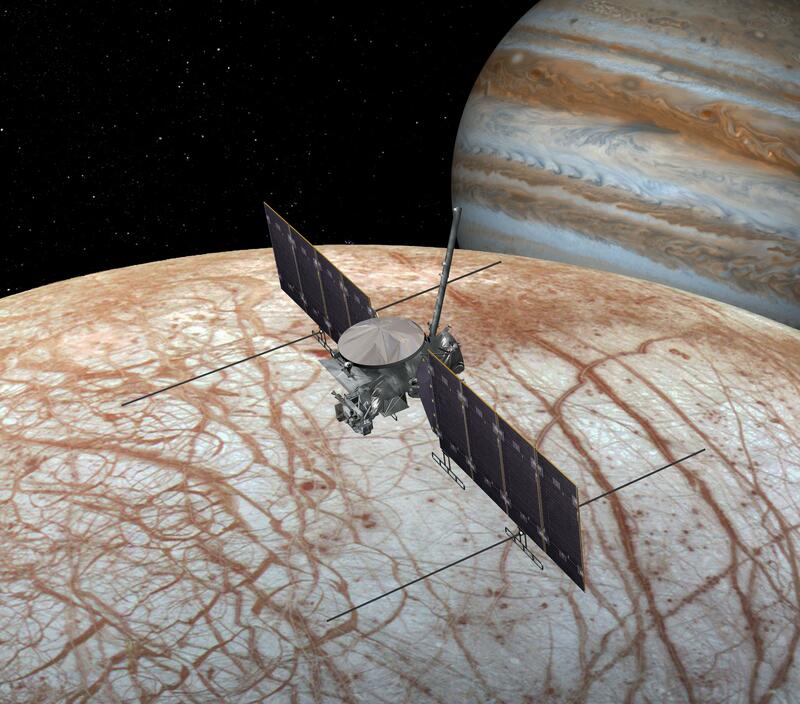 The Europa mission spacecraft is being planned for launch in the 2020s, arriving in the Jupiter system after a journey of several years. The spacecraft would orbit Jupiter as frequently as every two weeks, providing many opportunities for close flybys of Europa. The mission plan includes 40 to 45 flybys in the prime mission, during which the spacecraft would image the moon's icy surface at high resolution and investigate its composition and the structure of its interior and icy shell. The life cycle of a NASA science mission includes several key phases. At each step, missions must successfully demonstrate that they have met the agency's requirements in order to indicate readiness to move forward into the next phase. Phase B includes preliminary design work, while phases C and D include final design, spacecraft fabrication, assembly and testing, and launch. The Discovery Program currently consists of Discovery Missions, as NEAR, Mars Pathfinder, Lunar Prospector, Stardust, Genesis, CONTOUR, MESSENGER, Deep Impact, Kepler, Dawn, GRAIL, and InSight), five Missions of Opportunity ( ASPERA-3, Moon Mineralogy Mapper, NExT, EPOXI, and Strofio), the Discovery Data Analysis Program, the Sample Return Laboratory Instruments and Data Analysis Program, and planning for future mission announcements of opportunity. The mission of the Explorers Program is to provide frequent flight opportunities for world-class scientific investigations from space utilizing innovative, streamlined and efficient management approaches within the heliophysics and astrophysics science areas. The program seeks to enhance public awareness of, and appreciation for, space science and to incorporate educational and public outreach activities as integral parts of space science investigations. NASA has selected six astrophysics concept study proposals as part of the agency’s Explorers Program. NASA has selected six astrophysics Explorers Program proposals for concept studies. The proposed missions would study gamma-ray and X-ray emissions from clusters of galaxies and neutron star systems, as well as infrared emissions from galaxies in the early universe and atmospheres of exoplanets, which are planets outside of our solar system. The selected proposals, three Medium-Class Explorers missions and three Explorers Missions of Opportunity, call for focused scientific investigations and developments of instruments that fill the scientific gaps between the agency’s larger missions. The proposals were selected based on potential science value and feasibility of development plans. After concept studies and detailed evaluations, one of each mission type will be selected by 2019 to proceed with construction and launch. The earliest launch date would be in 2022. Medium-Class Explorer mission costs are capped at $250 million each, excluding the launch vehicle, and Mission of Opportunity costs are capped at $70 million each. Arcus would study stars, galaxies and clusters of galaxies using high-resolution X-ray spectroscopy to characterize the interactions between these objects and the diffuse million-degrees gas that surrounds and permeates them. Principal investigator: Randall Smith at the Smithsonian Astrophysical Observatory in Cambridge, Massachusetts. FINESSE would investigate the processes that govern planet formation and global climate, and probe the mechanisms that establish atmospheric chemical composition and shape atmospheric evolution. It would perform transit spectroscopy of at least 500 exoplanet atmospheres in the visible and near infrared range for planets ranging from super-Earths to sub-Neptunes to gas giants. Principal investigator: Mark Swain at NASA’s Jet Propulsion Laboratory (JPL) in Pasadena, California. SPHEREx would perform an all-sky near-infrared spectral survey to probe the origin of the universe, explore the origin and evolution of galaxies, and explore whether planets around other stars could harbor life. Principal investigator: James Bock at Caltech in Pasadena, California. COSI-X is a balloon-borne, wide-field-of-view telescope designed to survey the gamma-ray sky at 0.2-5 MeV, performing high-resolution spectroscopy, wide-field imaging, and polarization measurements. COSI-X would map gamma-rays from antimatter around the Milky Way's center, as well as from newly-formed radioactive elements in the debris of stellar explosions. Principal investigator: Steven Boggs at the University of California, Berkeley. ISS-TAO is a wide-field X-ray transient detector aboard the International Space Station that would observe numerous events per year of X-ray transients related to compact objects. The mission’s primary goal is the detection of X-ray counterparts to gravitational waves produced by neutron stars merging with black holes and other neutron stars. Other targets would be supernova shocks, neutron star bursts, and high redshift gamma-ray bursts. Principal investigator: Jordan Camp at NASA’s Goddard Space Flight Center in Greenbelt, Maryland. A Partner Mission of Opportunity (PMO) has been conditionally selected to provide detectors for the Fine Guidance Sensor assembly of the Atmospheric Remote Sensing Infrared Exoplanet Large-Survey (ARIEL) mission -- one of three proposed missions currently under consideration by ESA (European Space Agency). The PMO would proceed with construction only if ARIEL is selected by ESA. CASE would provide packaged detectors to ARIEL’s Fine Guidance Sensor assembly. ARIEL would measure the spectra of hundreds of warm and hot transiting gas giants, Neptunes, and super-Earths around a range of host star types. Observations of these exoplanets will allow us to understand the early stages of planetary and atmospheric formation during the nebular phase and the following few millions of years. The Explorers Program is the oldest continuous NASA program designed to provide frequent, low-cost access to space using principal investigator-led space science investigations relevant to the Science Mission Directorate’s astrophysics and heliophysics programs. Since the Explorer 1 launch in 1958, which discovered Earth’s radiation belts, the Explorers Program has launched more than 90 missions, including the Uhuru and Cosmic Background Explorer (COBE) missions that led to Nobel Prizes for their investigators.